Linking smallholder women farmers to markets: Which approaches work best? The first-ever global conference on women in agriculture was held on 13-15 March 2012 in New Delhi, India. The conference gathered women farmers, researchers, policymakers and other stakeholders from all over the world to discuss current and emerging gender-related issues in agriculture and research, as well as derive lessons for future sustainable, gender-sensitive development. The International Livestock Research Institute (ILRI) was represented at the conference by Jemimah Njuki, leader of ILRI's Poverty, Gender and Impact team. Njuki's presentation, Linking women farmers to markets: Patterns of market participation, decision making and intra-household income management, explored various approaches to linking smallholder women to markets as a critical pathway towards their economic empowerment. 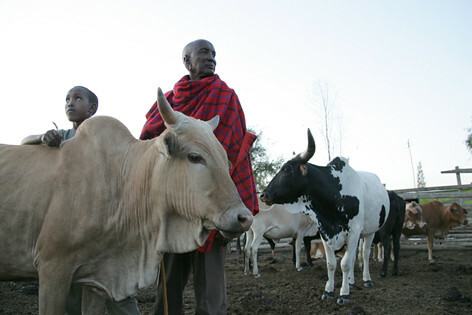 Maasai father and son tend to their cattle in Kenya. Informal channels are important sources of livestock information but there are gender disparities in access to information among male-headed rural households in Kenya (photo credit: ILRI/Mann). Informal channels such as farmer to farmer interactions are more important sources of information on livestock production and marketing for rural farmers in Kenya than co-operative groups, government extension services and radio, a new study has found. However, this farmer to farmer exchange is more popular among women farmers than among their male counterparts. The study, published in the February 2012 edition of Livestock Research for Rural Development, assessed how women’s access to livestock information and financial services compares to that of men among male-headed rural households in four districts in Kenya: Kajiado, Kiambu, Meru and Tharaka. The study also revealed gender disparities with respect to training of farmers in livestock production and marketing. Men in male-headed households received more training on a greater variety of technical topics such as livestock breeding, health and marketing, whereas women mostly received training on general aspects of livestock management. Trainings were mostly held within the village but outside the home. “Increasing access to training by women will require holding training in venues that do not constrain women,” the authors suggest. Gendered disparities were also observed in access to financial services. Although both men and women relied on groups as their main source of credit, more men than women obtained credit from formal financial service providers such as banks, microfinance institutions and co-operative societies. On the other hand, more women than men obtained credit from neighbours and friends. For this reason, the authors recommend that “provision of credit facilities should be flexible and have consideration for women’s constrained access to collateral”. 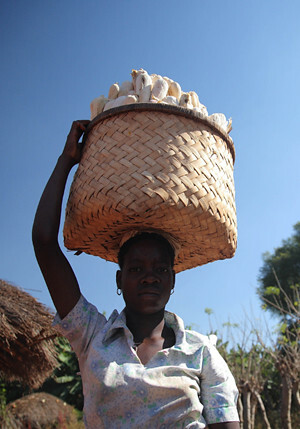 A Mozambican farmer takes her maize harvest to market. Development of agricultural markets in sub-Saharan Africa can boost economic growth and improve livelihoods (photo credit: ILRI/Mann). The Alliance for a Green Revolution in Africa (AGRA) and the International Livestock Research Institute (ILRI) have released the proceedings of an international conference held in Nairobi, Kenya in May 2009 to examine the role of agricultural markets in spurring economic growth in sub-Saharan Africa and improving livelihoods. The AGRA-ILRI conference brought together 150 of the world’s leading market experts to document the practices, policies and investments that can drive agricultural market development in sub-Saharan Africa; reveal the gaps and shortcomings that continue to create barriers; and identify priority actions that should be taken by governments, the private sector, donors and other stakeholders. The issues discussed at the conference are especially timely in light of recent surges in food prices and the significant burden this is inflicting on millions of poor people, underscoring the urgent need for action. The proceedings include two papers lead-authored by researchers from ILRI's Markets, Gender and Livelihoods theme. The paper, Integrating informal actors into the formal dairy industry in Kenya through training and certification by Amos Omore and Derek Baker reviews current thinking on the role of informal agribusiness in pro-poor development, and reports on the example the Smallholder Dairy Project in Kenya. The project featured collaborative and participatory research, along with training and certification in hygienic milk handling practices as a practical mechanism for optimizing milk quality and addressing regulatory barriers. It also targeted and helped achieve policy change, which enabled wider piloting of the training and certification activities incorporating a business development service approach by national authorities. In their paper, The impact of non-tariff barriers on maize and beef trade in East Africa author Joseph Karugia and others report on the use a spatial equilibrium model to quantify the impact of non-tariff barriers – such as licences, taxes and customs duties – on the intra-country flow of trade in maize and beef in Kenya, Tanzania and Uganda. The study found that reducing or completely removing the existing non-tariff barriers would result in increased intra-regional trade flows, with Kenya importing more maize from both Uganda and Tanzania, while Uganda’s beef exports to Kenya and Tanzania would increase. The overall result would be positive net welfare gains for the maize and beef sub-sectors across the entire East African Community. Contact Anne Mbaabu of AGRA (AMbaabu @ agra-alliance.org) or Steve Staal of ILRI (s.staal @ cgiar.org) or visit the conference website. ILRI (International Livestock Research Institute). 2011. Towards priority actions for market development for African farmers: Proceedings of an international conference. 13-15 May 2009, Nairobi, Kenya. AGRA (Alliance for a Green Revolution in Africa) and ILRI (International Livestock Research Institute), Nairobi, Kenya.